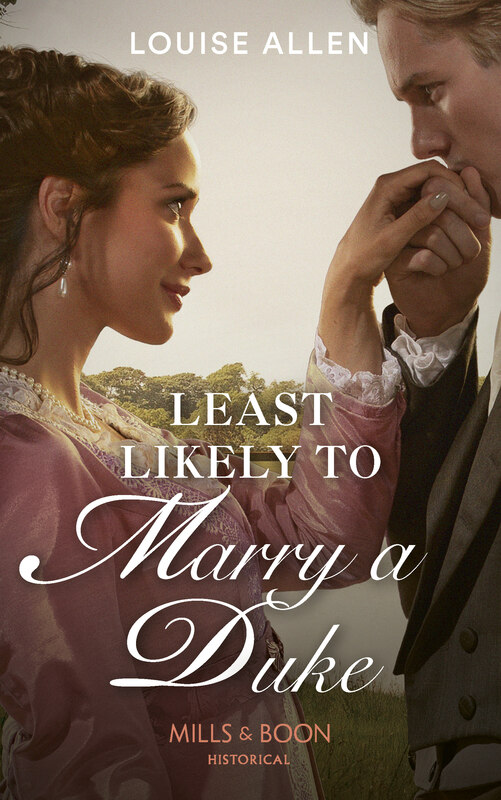 A marriage between the aristocratic hero and his true love in St George’s Hanover Square forms the climax of many a romantic historical novel, and I’ve used that scene myself. The church, completed in 1724, was built to serve the new and expanding residential area between Piccadilly and Tyburn or Oxford Road (now Oxford Street). These handsome streets and squares were a magnet for the upper classes in Society and handsome St George’s was the perfect place to be married or to have your children baptised. The 5th Earl of Jersey, husband of Lady Jersey one of the famous Patronesses of Almack’s, was a churchwarden here, although their marriage was a private one by special licence in their Berkeley Square house. In a detail from John Roque’s map of 1747 (below) the new church sits with Burlington House to the South and Berkley (as it was then spelled) Square to the South West. True, it is not in Hanover Square at all, but on the East side of George Street and its position gives the West front a cramped outlook, almost but not quite, looking down Maddox Street. The view at the top of the post (1812, from Ackermann’s Repository) is probably the best angle, then and now. It is sometimes easy to forget that the occupants of these fashionable squares, great mansions and elegant terraces were serviced by a multitude of tradesmen, servants and labourers, all of whom ‘lived in’ with their employers or set up shop close by or who lodged within easy walking distance of their employment. St George’s was their church too and in between the glamorous christenings and marriages the humbler parishioners were in and out, tying the knot, naming their babies and being buried. This was brought home to me by discovering my great-great-great grandfather James Wood marrying Mary Baldwin at St George’s. This was a surprise – James was a humble labourer turned chair mender and caner from Berkhamstead in Hertfordshire. What was he doing in London, let alone getting married in Mayfair? Then I discovered that he was a ‘servant’ (no idea what kind) of the Earl of Bridgewater whose country house was at Ashridge, close to Berkhamstead. The Earl had a London home in Albemarle Street (bottom, centre on the map), so presumably James Wood was there serving his employer in some capacity. After that discovery ancestors marrying or having children baptised at St George’s in the 18th and early 19th century started appearing in large numbers – all from the concentration of piano makers in Marylebone, just North of Oxford Street. 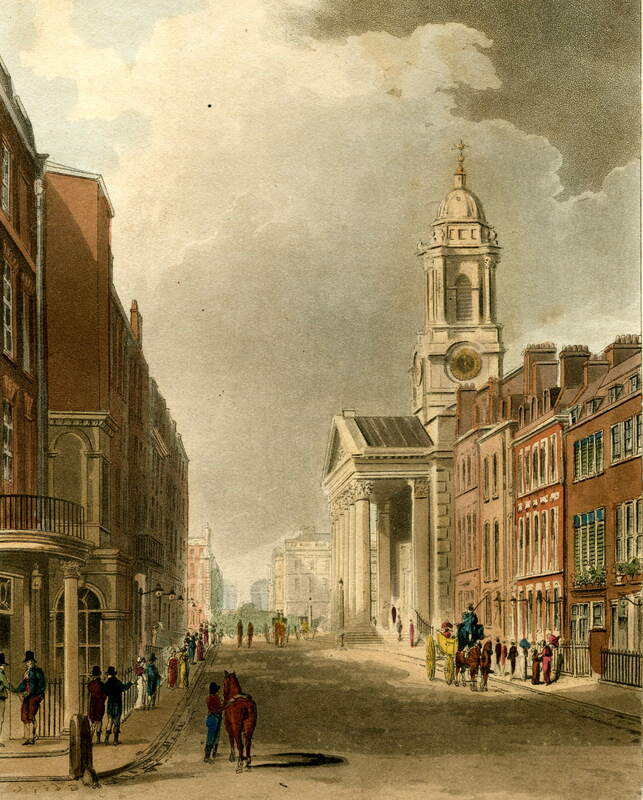 Possibly St George’s was seen as an aspirational place to be married because the Marylebone piano key makers, piano string makers, piano striker coverers and occasional dolls’ eyes makers did have other options in the various chapels of ease that had been built to help ease the pressure on the churches in these new and crowded districts. One of those chapels can be seen on the map on Conduit Street facing up George Street. This was Trinity Chapel and had one of the strangest histories of any London place of worship. A Chapel of Ease was a chapel either built before a parish church was in existence or added later to take the strain in a very large or crowded parish. This one started life as a moveable Roman Catholic chapel on wheels used by King James II. After he fled the country in 1688 to be replaced by William and Mary, the chapel was abandoned on Hounslow Heath where James had abdicated. Probably he took mass there in one of his last acts as king. It was transported to Conduit Street and turned into an Anglican Chapel of Ease on the initiative of Archbishop Tenison. Later it was acquired by bookseller and High Bailiff of Westminster James Robson, who had it demolished and rebuilt in brick, but because it was on leasehold land it was not eligible to be a parish church, hence the need for St George’s to be built. Unfortunately no images of the remarkable ‘traveling tabernacle’ seem to have survived and Trinity Chapel was demolished in 1875, the owner of the ground having decided that secular buildings would be more profitable. France was still in the grip of a miserable, cold, foggy Spring but Napoleon would have been encouraged by Britain’s reluctance to declare war, giving him more time to wrestle with his constitutional and political problems and continue to expand his army. An insecure British government was facing Radical opposition within the Commons and on the streets, the economy was shaky and everyone was depressed by the weather. The price of bread was rising, the farmers were having a tough time because of the rain and the King’s health kept him out of the public eye – “his disorder continues without any sensible alteration,” according to the bulletins. The Whigs were attacking the head of the diplomatic corps, Lord Castlereagh, and, through him the Congress of Vienna, dominated by Russia, Prussia and Austria who, they said, were a threat to independent nations. Vociferously led by Samuel Whitbread they argued that Napoleon had the support of the French people and it was wrong to go to war simply because Britain did not like him. Whitbread argued that the Emperor was now peace-loving, Castlereagh countered that once he had assembled 400,000 troops it would soon become apparent how peace-loving he was. The harassed government was faced with mobs on the streets protesting about the Corn Law, the Income Tax, the slave trade and the Prince Regent’s extravagance, but they finally decided that Napoleon was secure on the French throne and that war was inevitable. The Allied Treaty, signed at Vienna on 25th March, was laid before the House at last – if Parliament ratified it, it became a declaration of war. It was approved in the Lords by 156 votes to 44 and in the Commons by 331 to 92 on 25th May. War was now inevitable, the only question was – when? The firebrand Samuel Whitbread fell strangely silent after this, his place as the radical leader taken by Francis Burdett and Henry Hunt. Whitbread may have been in financial difficulty and earlier in the month he had resigned his management of Drury Lane Theatre, in which he had invested a great deal of money. At Drury Lane on the 24th, there was a benefit performance by Edmund Kean, announced as a never-before performed tragedy by Shakespeare. The newspapers the next day were respectful of Kean, but sarcastic about the play. Conduit Street, the the heart of fashionable Mayfair, runs off Bond Street to the north-east, about half way down, From it George Street turns off north to Hanover Square, passing St George’s church, famous for Society weddings, on the way. Conduit Street itself had a number of hotels during the late 18th-early 19th century, including Limmer’s, the dirtiest hotel in London according to Captain Gronow, despite being a favourite of the rich squirearchy. Another was Warne’s, located on the northern side, half way between George Street and Mill Street. 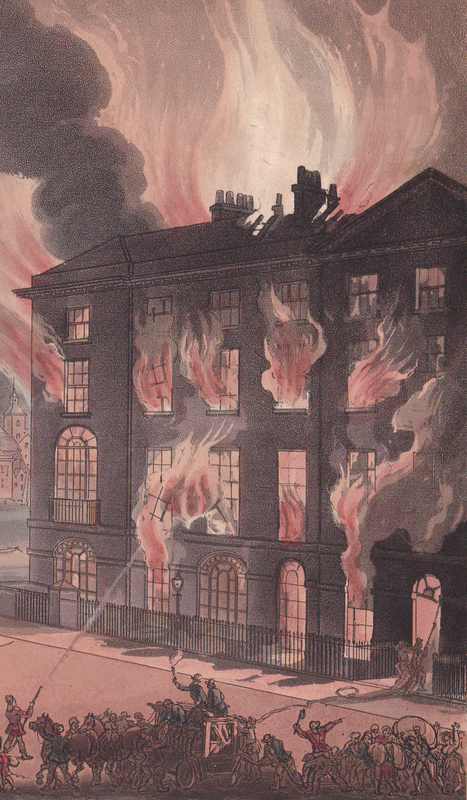 At half-past four, yesterday afternoon, a most alarming fire broke out at Warne’s hotel, in Conduit-street, Bond-street. The hotel consisted of two houses, being No.19 and 20. [The numbering has remained the same, so the site is easily identified today]. The appearance, on its first breaking out, was most frightful. A great body of smoke issued from the premises, which entirely prevented the passengers [ie pedestrians] from seeing their way in the street. The inmates of the house, including several gentlemen and families, flew in every direction. In an instant afterwards, the flames burst out from every window of the house, and the whole side of the street, from the corner of George-street, Hanover-square, to Mill-street, was enveloped in flames, threatening destruction to the whole neighbourhood. The drums beat to arms, and the St. James’s, Bloomsbury, and St George’s, Hanover-square, volunteers, [organised by the parishes] repaired to the spot with the greatest alacrity. Engines arrived in all directions, but water could not be immediately procured. The fire burned with the greatest rapidity; the first house was nearly consumed before the engines could be brought to play with any effect, though the firemen used every exertion in their power; – the wind being very high, the flames spread to such an extent, that it was almost impossible for them to work. Many of them rushed into the Hotel to save some of the property, and, we are sorry to say, that, according to the latest account we could collect, four firemen and a boy were missing. The fire was got under about nine o’clock at night. The Hotel is entirely destroyed, and part of an adjoining house, including the back premises, which extend nearly to the gates of St. George’s Chapel, in George-street, Hanover-square. The evening service was not over at the time the fire broke out; the flames seen through the windows of the chapel alarmed the congregation. The service was immediately stopped, and the congregation made their escape. Great confusion ensued; the charity children, who always attend there, ran in every direction – some without their hats, the girls without bonnets or cloaks. We are afraid that many persons were hurt, as the confusion was very great, and the congregation numerous. We understand the church plate was secured, as the Chapel, at one time, was thought in great danger. Great praise is due to the Earl of Chesterfield. On hearing of the accident, he sent for a party of horse [cavalry], who instantly repaired to the spot, and cleared the carriages in Bond-street, which were four a-breast, and entirely impeded the progress of the engines. Earl Percy also ordered the engine from Northumberland House [ie his private fire engine] to attend; and the Duke of Portland sent out a supply of ale to those who were employed at the fire. 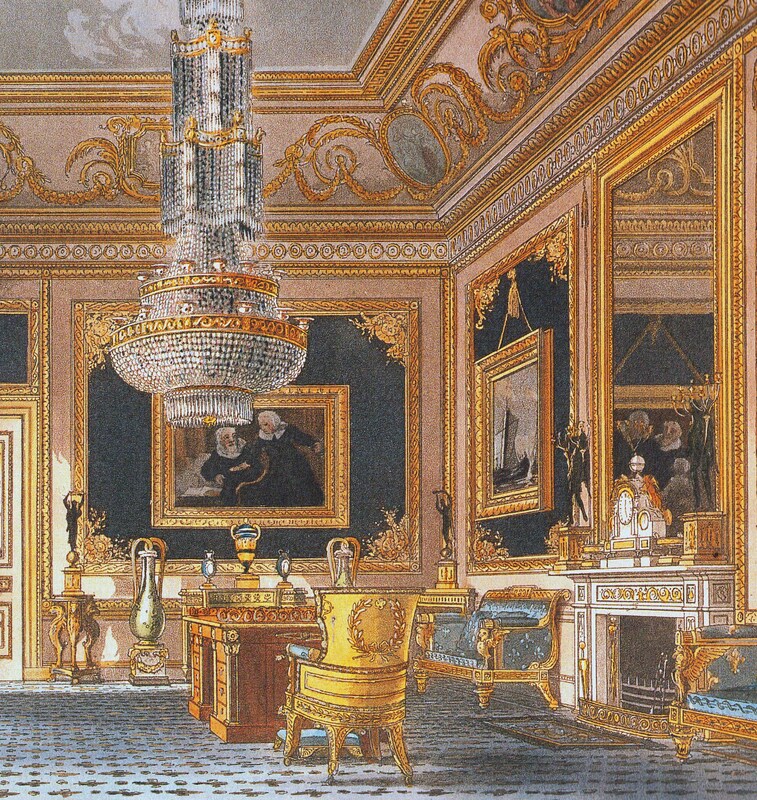 Sir Walter Farquhar ordered his servants to render every assistance, and great part of the furniture saved from the flames was brought into his house. A fireman of the Phoenix-Office [insurance company], of the name of Rushfield, was very much injured; the hair of his head was entirely burnt off, and part of his clothes. He was rescued from his perilous situation by a milkman who served the house, and ran to give every assistance; he was also very much burnt in the hand. Most of the families that were in the hotel, as soon as the alarm was given, went to Bates’s and other hotels, in Jermyn-street, St. James’s. 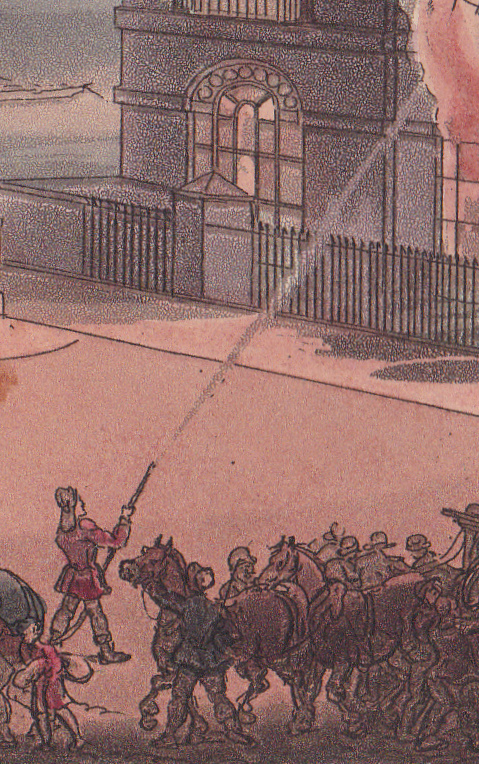 The scenes of fire and the details of the fire engines and firemen pumping are from a print by Rowlandson and Pugin, published by Ackermann in 1808. It is entitled “Fire in London” and shows a house on fire at the southern end of Blackfriars bridge. The print of George Street from the junction with Conduit Street shows St George’s on the right. 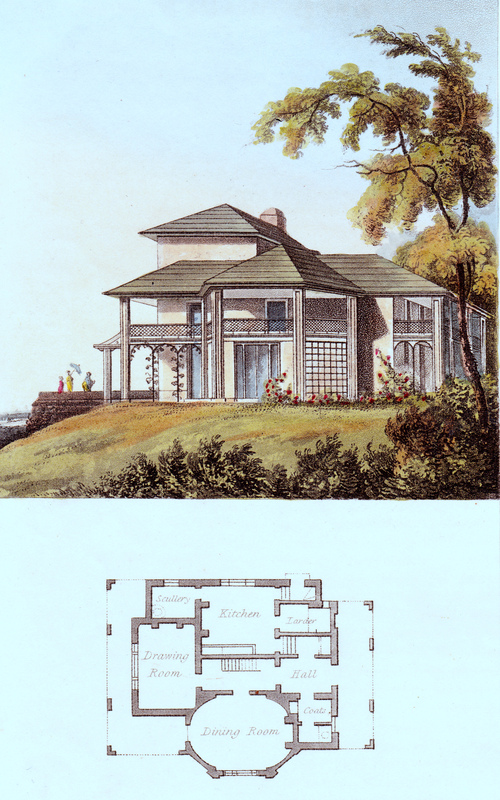 It appeared in Ackermann’s Repository in 1812.